Joe Mason and I have written about 11 for many years and have pages and pages of e-mails received from hundreds of people who have seen the number come up on their clocks. Not that this time is the only important one, lots of other numbers come up as well and Joe and I have tracked them all. A site search of our web domain shows that we have over 1,000 pages just relating to numbers. Let me share an e-mail received on October 28, 2011 relating to the whole 2012 issue including 11/11/11. It clearly lays out the importance oof numbers in our lives. This was put together by our number expert Norma Smith. start the Oct 27 ceremonies at power points across the continent. where October as 78 = Start, Renewal. 27 is also number symbol inverted Y, Unity from Diversity. something ) and sum for Humanity, Perfection, DNA Template. Initiation as 111, and our final number 27 as 9,9,9. 105 also = DNA Molecule. Friday October 28 = 169, which is 13 x 13. 17 August 2010 at Lurkeley Hill near East Kennett, Wiltshire. illustrations on the left -- the fourth one from the bottom. calendar on December 21, 2012, at 11:11 AM Universal Time? to slay the third part of men. This certainly seems negative, but I believe it indicates a positive result in the long run. Certain dreams and things indicate that being killed can symbolize a stressful death/rebirth, which actually means a big change in ways of thinking and being. when it strikes a man. "Resurrecting" one-third of all numbers may symbolically relate to the last line of Revelation 9:15 -- "to slay the third part of men" -- that is, one-third of the people will be Resurrected in the stressful manner. Another interesting fact is that exactly 100 years prior to November 11, 2011, a very strange event happened. A record-breaking cold snap took place in the central part of the USA. This became know as The Great Blue Norther of 11/11/11. In many cities, the high and low temperature records were broken that same 11-11-11 day. The event may have been symbolic of negative events ahead through the warring century. Dreams have made it clear to me that the relative amount of heat or cold can suggest a warm heart or a cold heart. The spiritual meaning of number eleven is quite diverse. The number 11 is thought of as a "master" number in numerology because it is a double digit of the same number. When this occurs - the vibrational frequency of the prime number doubles in power. Meaning, the attributes of the Number One are doubled. So, the very basic & primary understanding of the Number One is that of new beginnings & purity. When we see this digit doubled as with the 11 - then these attributes double in strength. Consequently, constant reoccurances of Elevens often signal us to be aware of our balance. Balance emotion, thought, spirit - balance of masculine, feminine, - work, play - joy, sorrow - - - Elevens are magical messages asking us if we are centered or out-of-whack. When we add 1+1 (eleven reduced) we get two - which is also a balance number - two's also deal with equality, justice, calm, kindness, tact, and duality. Those who recognize the spiritual meaning of number Eleven in their lives are obviously quite sensitive to many vibrational frequencies. The fact that this number is observed when the Elevens appear is indicative of a reflective, thoughtful and intuitive soul. Elevens often present themselves to psychically connected people. I believe this is the Universe sending us a message to be a part of an event - yet maintain your integrity as you do so (again, balance). If you observe the Eleven - as two straight lines side by side - together they serve as a full meaning - two figures forming one value - one image. However they do not touch - they are together yet separate. As we deal with energy in our lives it is integral for us to understand that we are all at once a part of it - yet we have the option to separate. 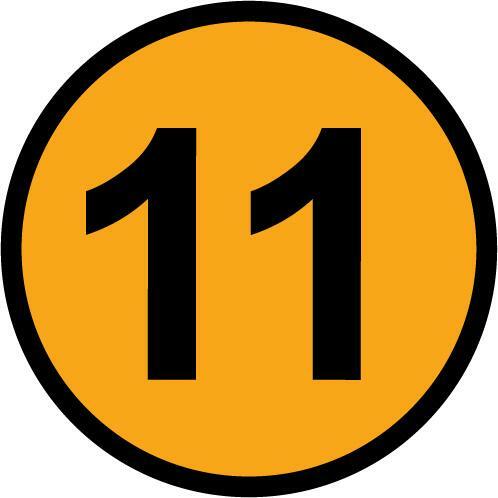 The spiritual meaning of number Eleven deals directly with our involvement with the progression of life and reminds us however, that we must not be a slave to our self-involvement. Jehovah said unto me, Prophesy unto the wind, and when I prophesied, the spirit entered into them, and they stood upon their feet (Ezek. 37:9, 10). A voice speaking unto me, said, Son of man, stand upon thy feet; and the spirit entered into me and stood me upon my feet (Ezek. 2:1, 2). I fell on my face, then the spirit entered into me, and set me upon my feet (Ezekiel 3:23, 24). Peter said, Thou shalt not wash my feet only, but also my hands and my head. Jesus said to him, He that is washed needeth not save to wash his feet, and the whole is clean (John 13:9, 10). AR 512. Verse 12. And they heard a great voice out of heaven, saying unto them, Come up hither, signifies that these two essentials of the New Church were taken up by the Lord into heaven, whence they came, and where they are, and the protection of them. By "a great voice from heaven" is signified from the Lord, for a voice from heaven is from no other source; "come up hither," signifies their being taken up into heaven, whence they came, and where they are, and their protection. AR 513. And they went up into heaven in a cloud, signifies the taking them up into heaven, and conjunction there with the Lord by the Divine truth of the Word in its literal sense. By "ascending up to heaven" is signified their being taken up by the Lord into heaven, as in (n. 512); in the present case, also, conjunction with the Lord there, because they ascended "in a cloud," for by "a cloud" is signified the literal sense of the Word (n. 24), and by this there is conjunction with the Lord, and consociation with the angels, see The Doctrine of the New Jerusalem concerning the Sacred Scripture (Sacred n. 62-69). AR 514. And their enemies saw them, signifies that they who are in faith separated from charity heard them, but remained in their own falsities. By "seeing the two witnesses" is signified to hear these two essentials of the New Church, and also to see the confirming things from the Word; because they saw them "ascending in a cloud," and by "a cloud" is signified the sense of the letter of the Word (n. 24, 513); that, nevertheless, they did not receive them, but remained in their own falsities, is evident from this, that no more is said than that "they saw," and it follows that "there was a great earthquake," in which they perished. By "enemies" are meant "they who were in the great city, which is spiritually called Sodom and Egypt," who were those that are in faith separated from charity, as may be seen in (n. 501, 502, and following numbers).